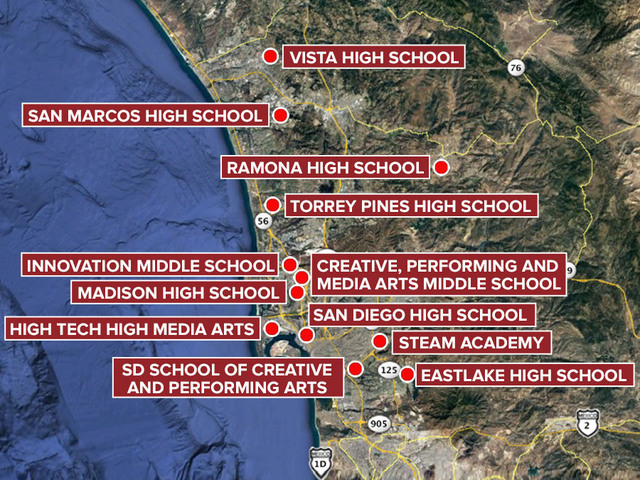 SAN DIEGO (KGTV) - Threats made against the San Diego School of Creative and Performing Arts, Steam Academy in Spring Valley, Ramona High School, and San Diego High School were deemed not credible, but law enforcement patrolled all schools Friday as a precaution. The threats against SDSCPA and SDHS were posted to social media Thursday, claiming there would be a school shooting Friday. Authorities deemed those threats not credible. One student has since been identified as a suspect behind those two threats, in addition to threats this week against Madison High School and Creative Performing Media Arts Middle School. The nature of the threat against Steam Academy was not immediately revealed, though authorities also deemed that threat non-credible. Despite their conclusion, police sent officers to the SDSCPA campus at 2425 Dusk Drive, Steam Academy at 1001 Leland Street and the SDHS campus at 1405 Park Boulevard Friday out of an abundance of caution. Sheriff's deputies responded to Ramona High School after staff notified SDSO of a threat. Deputies said a student told several other students not to come to school Friday because there would be a shooting. The threat was determined not to be valid after the student was contacted and admitted it was a hoax. Two days ago, three county schools -- Madison High School, Vista High School, and Innovation Middle School -- also received threats that were determined to be unsubstantiated. Extra security was present at those campuses. Earlier in the week, security was heightened at San Marcos High School after a threat was made on social media . However, the post did not appear to specifically target the North County school. Police also responded to a threatening message written in a restroom at High Tech High Media Arts in Point Loma, but the message did not appear to be credible.